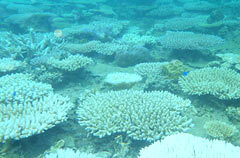 On August 10, a community of bleached coral, such as table and other varieties of coral, on a reef in Kunigami. Nature guides have confirmed coral bleaching in the whole area of reefs in Kunigami. Some experts say that rising sea temperatures caused by record-breaking heat and strong sunlight have affected the condition of the coral reefs. Large scale coral bleaching has occurred for the first time in 15 years, with the last incidence being in 1998. The bleaching that occurred in Okinawa in 2001 and 2007 did not really affect the Kunigami region, but these latest developments cause concern about the future of coral. The bleaching has mainly occurred in the communities of stony coral such as table coral. The coral reefs in Kunigami were only slightly damaged when worldwide bleaching occurred in 1998, and it recovered over the next ten years. On August 16, the Okinawa Meteorological Observatory announced that sea surface has reached temperatures of more than 30 C. People are concerned about large scale coral bleaching in throughout the prefecture.